Ayia Napa, Cyprus - 82-84 Tefkros Anthias Str. 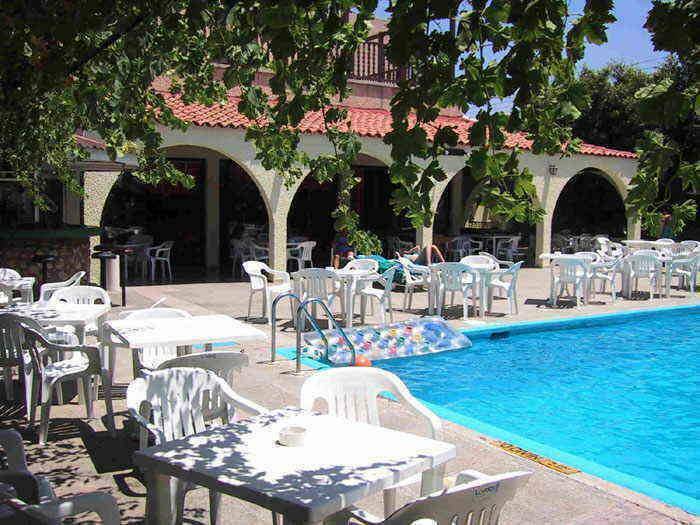 Also type family units, sleep 2 to 4 persons are available. Our bar service will be on hand to serve you hot and cold drinks along with hot and cold snacks and meals. Cocktails Local beers wines and spirits along with Happy Hours and late night service are all at you disposal, as are those that serve you. Our guests will enjoy a full breakfast where they will be able to select from a wide range from our Buffet breakfast to get you ready for the day ahead. For your Lunch and for your evening meal you will be able to savor the mouth watering local cuisine served by our resident Chef, while enjoying a glass or two of our fabulous local wines. All being enjoyed in the open patio restaurant in the warm night air. What could be better than good food, good wine and fabulous company? If you need a little more in the way of relaxation you will be able to visit our in-house solarium along with its health & beauty treatment centre. And not forgetting that all-important massage to ease away your aches and pains. Pool games, Darts, Safe Boxes, Doctor in the house. 1) Twin Room Bathroom/Showr En-suite with Two single beds. Rooms have Private Bath/Shower, Balcony, Aircondition, Satelite TV, Fridge. Direct Dial Telephone. Free hair dryer on request. BREAKFAST is charged extra @ euro 6. 00/person AIRCONDITION is charge extra @euro 5. 00 per day. FRIDGE in the room is charged extra euro 4. 00 per day. 2) Double Room with a King Size Bed with similar facilities. BREAKFAST is charged extra @ euro 6. 00/person AIRCONDITION is charge extra @euro 5. 00 per day. FRIDGE in the room is charged extra euro 4. 00 per day. 3) Trible Room with two single beds and one campbed, with similar facilities. BREAKFAST is charged extra @ euro 6. 00/person AIRCONDITION is charge extra @euro 5. 00 per day. FRIDGE in the room is charged extra euro 4. 00 per day. All Private Rooms are nicely furnished with Cypriot style Architecture and have Private Bath/Shower, Balcony, Aircondition, Satelite TV, Fridge and Hair Dryer on request, Direct Dial Telephone. BREAKFAST is charged extra @ euro 6. 00/person AIRCONDITION is charge extra @euro 5. 00 per day. FRIDGE in the room is charged extra euro 4. 00 per day. SAFE BOXES extra at euro 7. 00 per wk. 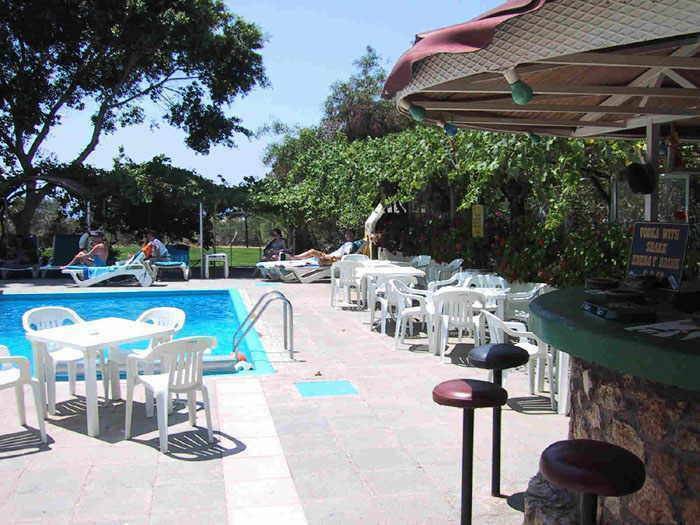 The Chrysland Hotel is a small friendly Family run hotel sitting in nature surounded with Vine trees, loans and flower beds, situated at Ayia Napa Cyprus, close to Nissi Beach, which is famous for her golden sand beach and crystal clear gentle Mediterranean water. An 8% to 10% per reservation, as a non-refundable security deposit for the booking, will be charged from the guests credit card UPPON RESERVATION. The balance is to be paid uppon arrival of the guests at the hotel. In case that the booking is cancelled within 3 days prior to arrival or now show up, the guest's credit card will be charged an additional sum equal to 3 nights accommodation. How to cancel: You can use the link in the confirmation email to cancel your booking The cancellation policy may vary per room type; please check the room description as well. 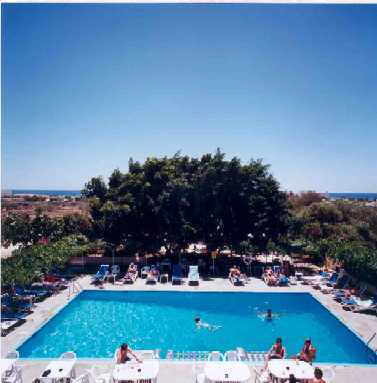 TO CHRYSLAND HOTEL AYIA NAPA CYPRUS. The taxi run from Larnaca airport to Ayia Napa is 45klm on a 40 munite drive along the highway all the way from the airport into Ayia Napa. Once you reach Ayia Napa on your right hand site of the highway you will see the Olympic Lagoon hotel. There we will wait for you with a long cool drink. |For help please call our reception. 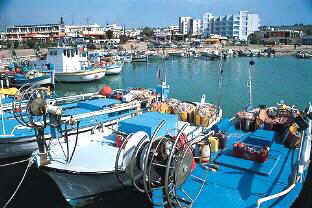 From Larnaka Airport We can arrange airport transfers for you on request at an extra fee in a 4 seater taxi at Euro 50. 00 each way. 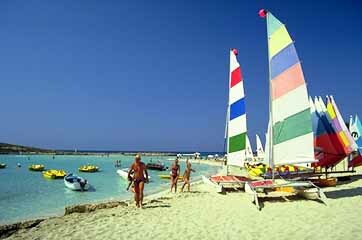 Nearest airport: Larnaka International Airport.